Thick rolling fog, craggy outcroppings, and touches of fall foliage everywhere. As we ascended up the mountain, first gliding above it all on a tranquil cable car ride and then pushing onwards up punishingly steep stairs, it became clear that our experience at Fanjing Mountain would be the epitome of a perfect autumn Saturday. This trip, as well as September’s visit to Yaoshang, was arranged by our local education department as a way of welcoming us to the area and encouraging us to become familiar with the local culture and attractions. Over the weekend before Halloween, we visited Fanjing Mountain and a nearby Miao minority village. Fanjing Mountain is China’s fifth largest Buddhist mountain, and is considered sacred despite the fact that only a few structures still remain from the former 48 Qing dynasty temples. It is a UNESCO biosphere reserve with 17 protected animal species and several rare plants, such as the dove tree. We were pleasantly surprised to find out that several other foreign English teachers from nearby schools would be joining us to visit this site of cultural and natural significance. After meeting them, we headed up a windy mountain road on a bus. Chinese drivers have no fear, and this was no exception. He sped around curves, honking rapidly to announce his imminent presence to anyone on the other side. After a short ride, we reached the cable cars and hopped in. We were really grateful that our guides had chosen this option, as the other is to climb 8,000 steps! The ride was beautiful, slowly carrying us over forested mountain valleys and then into a thick blanket of clouds. The clouds had an eerie feel to them, as if we were at the beginning of a horror movie before we knew the mist was evil or that the mountain held demons. We couldn’t see in any direction for several minutes, and only realized we were approaching the upper station when we started to hear the loud, excited clamoring of Chinese tourists. From the cable station, we still had another 1,000 steps to climb before reaching the main viewing platform. The white mist followed us up the steep wooden steps, obstructing every outlook. As we pushed up, and up, and up, we started to wonder if we would even be able to see anything from the top. We reached the platform and looked to the left. Absolutely nothing. Just a pure bright white abyss that made you wonder if this was actually a pathway to Heaven. And then… we rounded a corner and saw this majestic pillar piercing the sky! It was really an incredible sight, no photo can do it justice. And can you see the monastery at the top?? Craziness! At this point, we had to decide whether we wanted to climb that peak or a taller one with an older worship structure, as we were advised we wouldn’t have time for both. We opted for the higher viewpoint, and began our ascent up even more stairs! The higher we climbed, the more magnificent the views became. We admired towering rock formations, old stone worship enclaves, and the primary destination of this peak, a small weather-beaten building with a Buddha statue inside. The fog rolled along the sites, creating a moody autumn atmosphere. After Fanjing Mountain, we had supper at a village near Tongren that boasted a lake that was too deep to be measured (OK, China) and could predict the weather (how, we will never know…). They also allowed us to help prepare their specialty dish, sticky rice smashed into a dough and coated in peanut powder. We then traveled to Tongren, where we would stay the night before heading to the Miao village the next morning. Us and several of the other foreign teachers took the opportunity to go out to a bar with imported beer – yay for flavor! It was fantastic to swap stories, comparing and contrasting our experiences in rapid-fire English. There’s something weirdly thrilling about encountering other foreigners after being around the same four every week – you’re immediately ready to share your life’s story, and can’t wait to hear about theirs. It’s addictive to be able to speak your home language as quickly as you want all day and have others understand you perfectly. Remembering exchange students I met in high school and college, I’m learning newfound respect for the simple habits they must have also missed but that I never even considered. The next morning, we visited a tea field and one of the nearby Miao villages. The Miao people make up 25% of the population of Guizhou province. In a way, they are similar to Native Americans. They retain aspects of traditional dress and customs, and that the government has granted them some autonomy. Residents of the Basha Miao village are even allowed to carry guns, which is a rare exception to China’s extremely strict gun regulations. At the Miao village we visited, their tradition mandates that visitors must either sing a song or sample rice wine to enter. We tried a little of the wine, which was much sweeter than the versions we have been offered in Sinan! The people then provided a performance, which consisted of dancing, minor acrobatics, and a fire performer. The fire performer, a sassy fat man, was definitely the most interesting. He rolled a burning stick all over his body (including down the front of his pants!) and he ate the charred stick after swallowing its fire. Following the performance, we had time to walk around the village looking at its architecture and checking out the local vendors. It was an interesting stop and I enjoyed seeing their clothing and learning a bit about them, but the whole village felt very commercialized. It was hard to appreciate the culture when it felt like they were exploiting their own traditions to make money off of tourists. Thanks for sharing! Love hearing about your adventure! From Zhangjiajie to Tongren it is about 6 hours by train. From the train station, you can take a taxi to the bus station (less than half an hour), and from there a bus to Fanjingshan (about 1.5 hours). We did not personally follow this exact route so I cannot guarantee its accuracy, but I believe it should be correct (we were part of an education-group organized tour and did not have to plan the logistics). 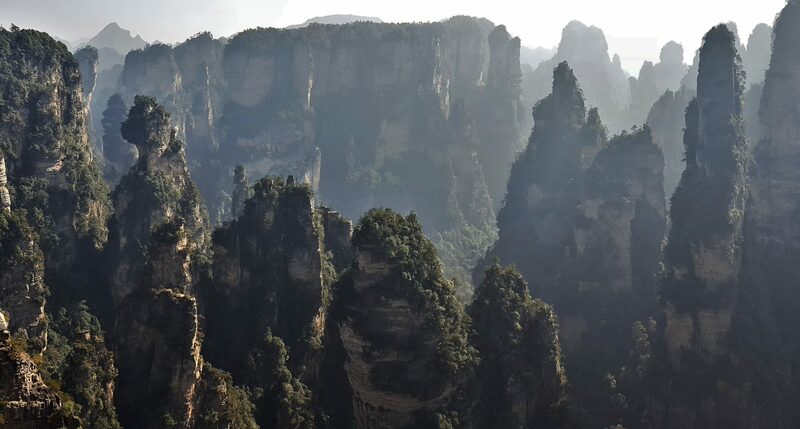 When we visited Zhangjiajie, we did take the bus to Tongren, from there a taxi to the train station, from there the train to ZJJ, so we are familiar with that part of the journey but not the bus from Tongren to Fanjingshan. Please feel free to ask away with any more questions you may have! The Contact Us form often yields the quickest response, I apologize for having missed this comment earlier. Have fun planning your trip, I know you will love China!! Thank you for the response, appreciate it. Anyway, can you recommend us some cheap but clean accommodation place (hotel, inn, hostel) near Fanjingshan and in Tongren also? And can you suggest other places to go in Fanjingshan/Zhangjiajie and in Tongren too? Please. We appreciate your response! Again, thank you for your help! Looking forward for our China trip! I should update my response on reaching Fanjingshan, after looking around a bit I did see a post which said in the high season a bus leaves from the tourist bus station near the railway at 7:30, 8:30 and 10:30 in the morning. Another site reported that in the low season you must go to the South bus station and first take a bus to Jiangkou, from there another bus to Fanjingshan (a total of 1 hour 40 minutes). As I said, I’ve never self-directed to Fanjingshan so I can’t verify exact directions. You may want to ask around when you arrive at the train station. In Tongren we have stayed at Wenzhou Hotel (温州大酒店), which is directly across the street from the bus station, and the Tongren Grand Hotel, which was on the same side of the street as the bus station (on the corner to the left if you are facing the station). The first I would recommend and the second was so-so. There is a 7 Days Inn near the Tongren railway station which we have not stayed at, but we did stay at a 7 Days in Anshun that was good, so it is probably a fairly safe bet. I’m not sure of hotels at Fanjingshan or Jiangkou. In Zhangjiajie of course the parks are the main thing, if you haven’t read our post on that yet you can access it from the top menu, Where We’ve Been. Otherwise if you have a specific question on that area fire away. Keep in mind that in Guizhou English-speakers are very few and far between so unless you speak Mandarin always keep a translator app handy (Google downloadable offline pack is a lifesaver). Also, while it may be tempting to try to see everything, make sure to pick your priorities and budget enough time to really see them. While there are a great many amazing things to see in China, you’d hate to be so rushed you didn’t properly enjoy any of them. If you want to discuss anything further via email feel free to use the Contact Us form linked in the top menu, or of course we are available through post comments as well.